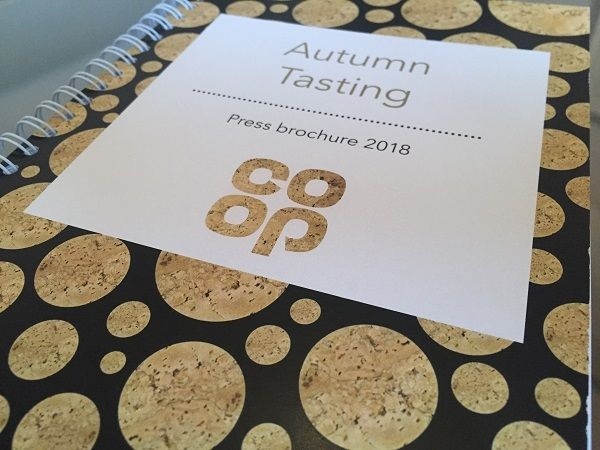 It was great to have the chance to attend the Co-op supermarket’s press tasting, where they showed the below 62 wines and a handful of spirits. All too often, wine people live in a fine wine world, which is a comparatively tiny part of the wine that actually gets sold, bought and drunk in the UK. Tasting a supermarket’s offerings is important to remember what goes on in the real world, and to assess the wines that most people drink, most of the time – even if this tasting had a disproportionate number of wines on limited release at less than 1,000 of the Co-op’s over 2,500 stores (not including the recent Nisa acquisition). It’s also a very good reminder of how hard the task is for supermarket buyers to source wines in the £5-8 core price bracket and actually deliver good value. With Duty rates meaning only 40-50p is available for the wine itself in a £5 bottle of wine, and only around £1.50 at £7, buyers have a job on their hands. 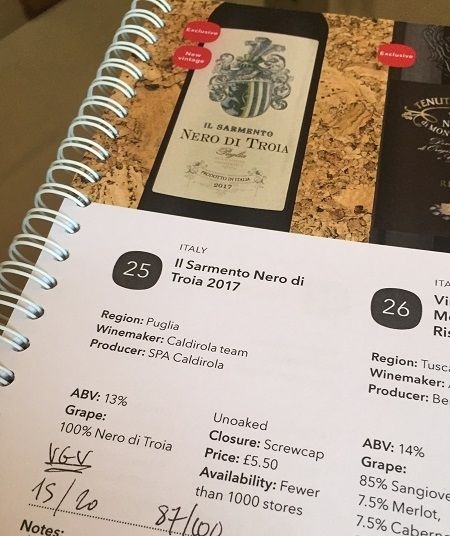 That’s what made Co-op’s sourcing of Caldirola’s Il Sarmento Nero di Troia 2017 particularly impressive, as it delivered very well for just £5.50 (15 / 20 or 87 / 100). There were a few others that demonstrated good value for money in the £6-8 range too. Of course there were misses. Early on, the Co-op Irresistible Viognier was very much resistible. If you’re going to let your marketing guys label it as such – you can’t really let that happen. Especially immediately before the textbook Semillon-heavy, barrel fermented Clos Floridène Graves Blanc 2016. Generally the Irresistible range didn’t do it for me, other than the Mount Benson Shiraz. That said, the Really Awesome Wine white, vegan Spanish blend had decent enough Verdejo character to pull off the RAW branding. The wines are listed in the order of the tasting book, although I actually tasted all the whites first, then went back to reds, before finishing with fortified and sweet wines. Made by Zonin. 100% Glera. 11% ABV. £8 / bottle. Made by Piper Heidsieck. 50% Pinot Noir, 30% Pinot Meunier, 20% Chardonnay. 12% ABV. £18.99 / bottle. 34% Chardonnay, 33% Pinot Noir, 33% Pinot Meunier. 12.5% ABV. £40 / bottle. Available in less than 1,000 stores. 60% Pinot Noir, 25% Chardonnay, 15% Pinot Meunier. 5-15% of primary fermentation in old oak barrels. 12% ABV. £44.99 / bottle. Available in less than 1,000 stores. 12.5% ABV. £13.75 / bottle. Available in less than 1,000 stores. 70% Pinot Blanc, 30% Auxerrois. 13% ABV. £11 / bottle. Available in less than 1,000 stores. 13.5% ABV. 100% Viognier. 15% oak aged for 3 months. Screwcapped. £8 / bottle. Available in less than 1,000 stores. Jean-Jacques Dubourdieu. 51% Sémillon, 47% Sauvignon Blanc, 2% Muscadelle. 8 months in oak on lees. 13% ABV. £19 / bottle. Available in less than 1,000 stores. 9 months in French oak. 13% ABV. £12 / bottle. Available in less than 1,000 stores. 10 months in French oak. 13% ABV. £39.99 / bottle. Available in less than 1,000 stores. 13% ABV. £8 / bottle. Available in less than 1,000 stores. 12-14 months in oak. 13% ABV. £24.99 / bottle. Available in less than 1,000 stores. 40% Grenache, 30% Syrah, 30% Carignan. 13% ABV. £7 / bottle. Available in less than 1,000 stores. 45% Syrah, 30% Grenache, 15% Carignan, 10% Mourvèdre. 13.5% ABV. £7.50 / bottle. Available in less than 1,000 stores. Vignerons Catalanes. 80% Syrah, 20% Grenache. 14% ABV. £10 / bottle. Available in less than 1,000 stores. 60% Grenache, 40% Syrah. Syrah aged in French oak for 8 months. 14% ABV. £10 / bottle. Available in less than 1,000 stores. 80% Grenache, 15% Syrah, 5% Mourvèdre. 13.5% ABV. £10 / bottle. 100% Syrah. Part aged for a short period in oak. 13% ABV. £18 / bottle. Available in less than 1,000 stores. Chateau de Tiregand. 55% Merlot, 20% Cabernet Sauvignon, 20% Cabernet Franc, 5% Malbec. 20% aged for 12 months in French oak. 14% ABV. £8 / bottle. Available in less than 1,000 stores. 80% Cabernet Franc, 20% Merlot. 60% aged in oak. 13.5% ABV. £9 / bottle. Available in less than 1,000 stores. 60% Merlot, 30% Cabernet Sauvignon, 10% Cabernet Franc. 50-70% aged in oak for 16 months. 14% ABV. £12.50 / bottle. Available in less than 1,000 stores. Alfred Tesseron. 48% Cabernet Sauvignon, 37% Merlot, 11% Cabernet Franc, 4% Petit Verdot. 12-15 months in 30% new oak. 13.5% ABV. £17 / bottle. Available in less than 1,000 stores. P: Dense, cassis spice and gravel mineral. Leafy tobacco. Compact, firm, ripe tannins. Needs time! Unoaked. 13.5% ABV. £8.50 / bottle. 100% Nero di Troia. Screwcapped. 13% ABV. £5.50 / bottle. Available in less than 1,000 stores. 85% Sangiovese, 7.5% Merlot, 7.5% Cabernet Sauvignon. 18 months in oak. 14% ABV. £12 / bottle. Available in less than 1,000 stores. 80% Corvina, 20% Rondinella. 12 months in French oak. 13.5% ABV. £11 / bottle. Available in less than 1,000 stores. 70% Corvina, 20% Rondinella, 10% Corvinone. 12 months in French oak. 15% ABV. £18 / bottle. Available in less than 1,000 stores. 40% Touriga Nacional, 30% Tinta Roriz, 30% Touriga Franca. Unoaked. 13.5% ABV. Helix, unscrewable, technical cork. £6 / bottle. 50% Garnacha, 50% Mazuela (Carignan). Aged in French and American oak. 14% ABV. £13 / bottle. Available in less than 1,000 stores. 100% Monastrell. Unoaked. 15% ABV. £10 / bottle. Available in less than 1,000 stores. 100% Tempranillo. Unoaked. Screwcapped. 13.5% ABV. £8 / bottle. Available in less than 1,000 stores. 100% Tempranillo. 18 months in American and French oak. 12.5% ABV. £9 / bottle. Available in less than 1,000 stores. 50-60% Airén, 30-49% Verdejo, 1-10% Sauvignon Blanc. Unoaked. 13% ABV. £8 / bottle. Available in less than 1,000 stores. 70% Viura, 30% Sauvignon Blanc. Unoaked. Screwcapped. 11.5% ABV. £6 / bottle. Available in less than 1,000 stores. Made by Bodegas Muriel. 100% Tempranillo. 12 months in American oak. Screwcapped. 13% ABV. £7.35 / bottle. 100% Garnacha. Unoaked. Screwcapped. 12.5% ABV. £8 / bottle. Available in less than 1,000 stores. P: Spiced, chewy, chalky texture. Some strawberry skin. Chalky, savoury style. Nice, but who is this for? 35% Touriga Nacional, 30% Tinta Roriz, 25% Touriga Franca, 10% Tinta Barroca. 5% aged in oak. 13% ABV. £10 / bottle. Available in less than 1,000 stores. 85% Tempranillo, 5% Garnacha, 5% Graciano, 5% Mazuelo. 2 years in French and American oak. 13.5% ABV. £19 / bottle. Available in less than 1,000 stores. 100% Sauvignon Blanc. Unoaked. Screwcapped. 12.5% ABV. £6.50 / bottle. 85% Chenin Blanc, 15% Viognier. Unoaked. Screwcapped. 12.5% ABV. £8 / bottle. Available in less than 1,000 stores. 76% Merlot, 24% Malbec. Unoaked. Screwcapped. 12.5% ABV. £7 / bottle. Available in less than 1,000 stores. Made by La Liga de Enólogos. 100% Malbec. Unoaked. 13% ABV. £6 / bottle. 100% Malbec. Unoaked. 14% ABV. £9 / bottle. 100% Malbec. 12 months in French oak. 14% ABV. £13 / bottle. Available in less than 1,000 stores. Made by Viña Indomita. 100% Carmenère. Screwcapped. 13.5% ABV. £7 / bottle. Available in less than 1,000 stores. 100% Sauvignon Blanc. Unoaked. Screwcapped. 13% ABV. £9.99 / bottle. 100% Sauvignon Blanc. Unoaked. Screwcapped. 13% ABV. £9.50 / bottle. 94.4% Sauvignon Blanc, 5% Pinot Gris, 0.6% Semillon. Unoaked. Screwcapped. 13% ABV. £7 / bottle. Available in less than 1,000 stores. 100% Pinot Gris. Unoaked. Screwcapped. 12.5% ABV. £9 / bottle. Available in less than 1,000 stores. 100% Chardonnay. 5-6 months in 20% new French barriques. Screwcapped. 12.5% ABV. £11 / bottle. Available in less than 1,000 stores. Made by Limestone Coast Wines. 100% Chardonnay. 25% aged for 6 months in French oak. Screwcapped. 12.5% ABV. £10 / bottle. Available in less than 1,000 stores. 100% Chardonnay. 8 months in French oak puncheons. Screwcapped. 14% ABV. £8.50 / bottle. Available in less than 1,000 stores. 62% Shiraz, 30% Tempranillo, 8% Other. 9 months in American oak. Screwcapped. 13.5% ABV. £9 / bottle. Available in less than 1,000 stores. 100% Shiraz. 12 months in French oak. Screwcapped. 13.5% ABV. £11 / bottle. Available in less than 1,000 stores. 100% Shiraz. 18 months in French and American oak. Screwcapped. 14.5% ABV. £11 / bottle. Available in less than 1,000 stores. Made by Limestone Coast Wines. 99.85% Shiraz, 0.15% Cabernet Sauvignon. 10% matured with French oak chips. Screwcapped. 13% ABV. £7 / bottle. Available in less than 1,000 stores. Made by Limestone Coast Wines. 50% Cabernet Sauvignon, 50% Shiraz. Unoaked. Screwcapped. 13.5% ABV. £10 / bottle. Available in less than 1,000 stores. 89% Sémillon, 10% Sauvignon Blanc, 1% Muscadelle. 18 months in French oak. 14% ABV. £13 / 37.5cL. Available in less than 1,000 stores. Petit Manseng, Gros Manseng. Unoaked. 12% ABV. £7 / 37.5cL. Available in less than 1,000 stores. Made by Bodegas Barbadillo. 15% ABV. £6.50 / 50cL. Available in less than 1,000 stores. Made by David Guimaraens at Quinta and Vineyard Bottlers. Blend including Touriga Nacional, Touriga Francesca, Tinta Roriz, Tinta Barroca and Tinta Cão. 20% ABV. £14 / bottle. Available in less than 1,000 stores. Made by David Guimaraens at The Fladgate Partnership. Blend including Touriga Nacional, Touriga Francesca, Tinta Roriz, Tinta Barroca and Tinta Cão. 20.5% ABV. £30 / bottle. Available in less than 1,000 stores.